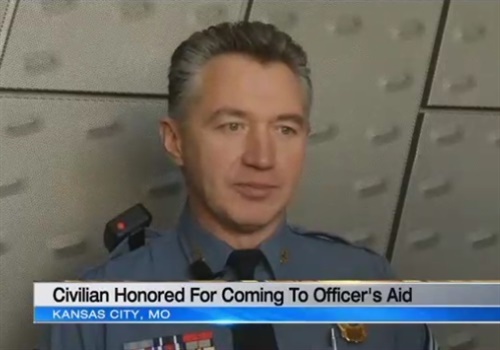 A man received recognition this week for coming to the aid of a Kansas City, MO, officer who was struggling with a suspect resisting arrest, reports KCTV. On Tuesday, the Kansas City (MO) Police Department gave Blake Applebury a certificate of appreciation. "Honestly, if it hadn't been for this gentleman, I don't know what would've happened," Sgt. Scott Simons said. Simons was on patrol in July when he spotted a stolen car. He radioed for backup as soon as he realized there were two people in the car, but the suspect walked out of the store before backup arrived. So Simons tried to arrest him on his own. "I got one handcuff on and unfortunately he caught me at a moment of disadvantage and knocked me to the ground. I was on my back and really just struggling to maintain control," Simons said. A crowd was forming, and they weren't on the officer's side. "All of a sudden this young man walked out of the crowd and jumped in, grabbed a hold of the upper body of the suspect and knocked him down, which allowed me to get him back into custody," Simons said. Simons says he watched as Applebury got grief from some in the crowd for stepping in and says his bravery will never be forgotten. "He obviously put his life in peril to help me. It was very reassuring there are still people out there willing to jump in and help," Simons said.